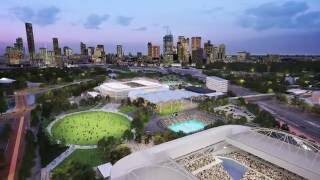 Major Projects Victoria has commissioned NH Architecture as the ongoing Masterplanners for the Melbourne and Olympic Parks Stage 3 redevelopment. The stage 2 Melbourne and Olympic Parks Masterplan Report prepared 2013, was approved in April 2014, which formed a basis for agreements between the State of Victoria, Melbourne and Olympic Parks Trust and Tennis Australia. The Stage 1 Masterplan included major updates to Margaret Court Arena, completed by NH Architecture in 2014. The Stage 2 Masterplan introduced three new projects into Melbourne Park which include: the recently completed Tanderrum Bridge and Tennis HQ and the upgrades to Rod Laver Arena, currently under construction. The Stage 3 Masterplan considers the long term needs of the precinct and aims to elevate the growth of the sporting and events profile. Proposed new works include; the spread of the existing court ladder east across the precinct, provision for a new show court, new function and media centre and improved public open areas. Understanding the key intricacies between the separation of the back of house facilities and public areas has been a major factor in developing the design, and understanding its operational importance supported by all stakeholders. The facilities must meet current best practices for ESD with the LEED Gold rating as the designated benchmark. The design strives to remain competitive and innovative on a national and international level, with a design focus on current top and future technologies.